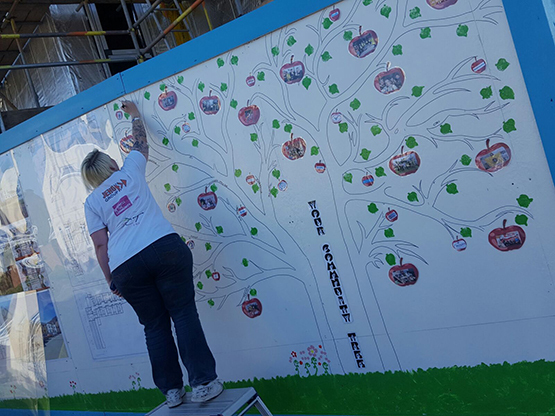 To showcase the huge level of community engagement on the Library Close construction site, Jehu has worked with a selection of community groups and organisations to design and create a “Community Tree”. The tree shows how the project team has engaged with the community to ensure the new project puts down firm roots within the established village of Rhydyfelin, and how they have built on those roots to build community links to ensure the new building sits comfortably within the village now and in the future. The tree showcases the huge spectrum of community engagement undertaken. This includes working with children of primary and secondary age, colleges and higher education facilities, extensive work with community groups for older people, charity work, health and well being and fittensss projects, employment and training projects and a plethora of health from both mental and physical aspects. The aim of the tree is to show the community that Jehu and Trivallis want to work with them, and ensure our work has a lasting positive impact on all aspects of community life, not just construction.